MicroEd Computers was established in 1984 and has been servicing the local area since the dawn of Computers. This historical knowledge means we understand every detail of your system, our staff haven’t simply learnt IT they live it. As such MicroEd is a technology umbrella staffed with experience from all walks of life. With this team we are geared to tackle anything from the most basic of computer enquiries through to Server and Workstation rollouts. Feel free to contact us or visit the office to find out more information about our business. Our Professional Services division provides a host of services for business including consultancy, phone support and onsite technicians. Our onsite technicians understand how critical your computer system is to your business and how expensive and damaging down-time can be. Our Professional Services division provide a range of services to ensure you can concentrate on the “task at hand” rather than the technicalities. 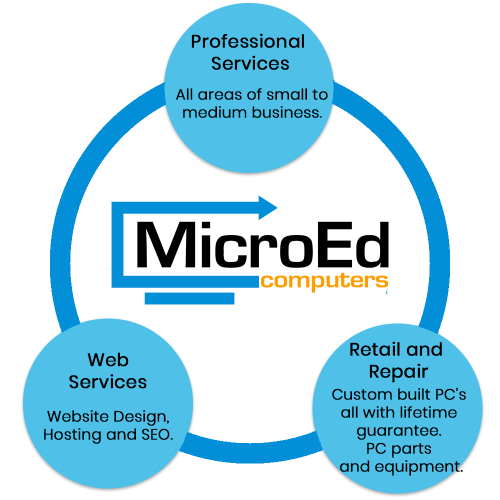 Everybody has their area of expertise and ours is in the area of Computer Consultancy. As a manager in today’s world you cannot avoid computers. Many Managers of non-IT companies fight a never-ending battle of trying to keep current with their industry as well as trying to keep pace with Information Technology. We keep our clients informed on movements in the industry, leaving them to do what they do best. We have many clients that simply call upon us to interpret computer jargon or provide them with an experienced, industry backed answer to computer related questions. Our code of ethics is that of the Australian Computing Society. The Computer Industry unfortunately has a terrible reputation. Computer companies are formed and go bust everyday leaving clients out of pocket and in same cases out of business. We joined the ACS in the hope that one-day the ACS or a similar organisation will become the standard or registrar for IT professionals. To become a member of the ACS you must meet certain qualification and experience criteria. Registration of IT Professionals would go a long way towards cleaning up the IT industry. The IT industry is constantly changing. We too must be ready for changes in the industry and keep our finger on the pulse. We spend a great deal of time and money on Industry Research and Training. In the Computer Industry you learn something new everyday. No-one can ever claim to know all there is to know about computers but we do our best to be informed in as many areas as possible and point our clients in the direction that gives them a cost effective, technological advantage. Our Retail Store is conveniently located at 3/52 Aerodrome Road with on-site parking available. The MicroEd Retail Store is your One Stop Computer Shop for Expert Advice, Sales, Computer Repairs, Upgrades, Custom Built Systems and Service. MicroEd Web Services provide all your needs when it comes to websites and website related services. Whether you are looking for a new website design, need your existing website maintained with several changes you have been wanting done or perhaps your looking for a brand new website at an affordable price. Our web development staff can assist you and your business, with MicroEd Web Services nothing is impossible! Click Here to go to our Web Services Page. Managing Director of MicroEd Computers Pty Ltd.